Some photographs are posted under the Fair Use doctrine of Copyright Act Of 1976, 17 U.S.C. § 107 for the purpose of criticism, comment, news reporting, teaching, scholarship, or research. Coin with unidentified foreign planchet will sell for over $1,000 in high grade. The identified and obvious foreign coin types can sell for upwards of $5,000+. The value will depend on the coin type, grade, denomination. Also, these mint errors must be identified by weight, the planchet metal, and by a certification service like PCGS or NGC. Undated Jefferson Nickel, Struck on a 1960 Peru 5 Centavos, MS67 by NGC. 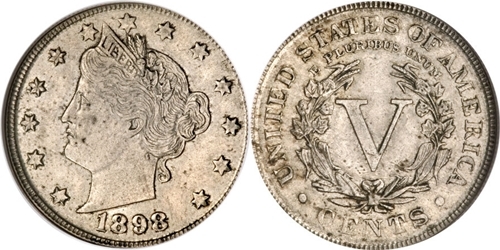 This particular example sold at Heritage Coin Auctions for $5,462.50 on Aug 13, 2010. 1898 5C Liberty Nickel, Struck on a Foreign Planchet, AU55 NGC. This particular example sold at Heritage Coin Auctions for $1,150.00 on Mar 29, 2009. The foreign planchet this Liberty Nickel was struck on was not identified, so having the coin identified and authenticated by a top tier grading service is a must. 1980-P 50C Kennedy Half Dollar, Struck on a Foreign Planchet, MS63 NGC. This particular example sold at Heritage Coin Auctions for $1,150.00 on Apr 7, 2006. The foreign planchet this Kennedy Half Dollar was struck on was not identified, so having the coin identified and authenticated by a top tier grading service is a must.